Hitherto untried on the international scene but on Friday 8th June at the Seamaster 2018 ITTF World Tour Lion Japan Open in Kitakyushu, at the quarter-final stage of the Mixed Doubles event, Korea’s Lee Sangsu and Choi Hyojoo alongside China’s Liang Jingkun and Chen Xingtong emerged the pairs to cause the upsets. Both accounted for higher rated adversaries. Lee Sangsu and Choi Hyojoo, the no.7 seeds, beat Chinese Taipei’s Chen Chien-An and Cheng I-Ching, the no.3 seeds and runners up at the Liebherr 2017 World Championships (11-9, 11-3, 7-11, 11-8); Liang Jingkun and Chen Xingtong, the no.8 seeds, overcame Hong Kong’s Wong Chun Ting and Doo Hoi Kem, the no.2 seeds, in a contest that proved a much closer affair. They emerged successful by the minimal two point margin in the deciding fifth game (11-6, 10-12, 11-9, 8-11, 11-9). 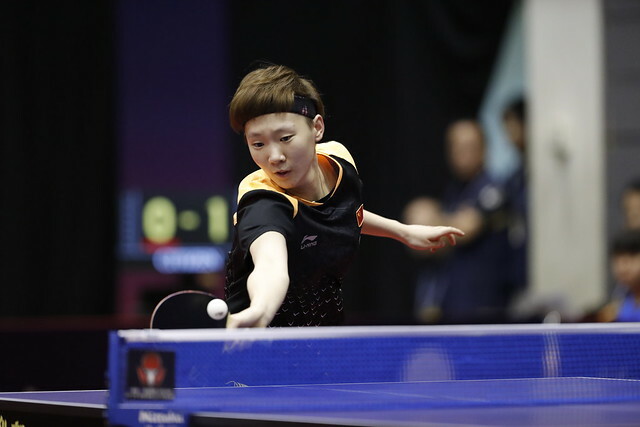 The win means that Chen Xingtong is on course to repeat her success of the previous week, when at the Seamaster 2018 ITTF World Tour Platinum Kaisa China Open in Shenzhen, she emerged successful in harness with colleague Lin Gaoyuan. Defeat for Hong Kong but there was success and success at Japanese expense; Ho Kwan Kit and Lee Ho Ching, the no.4 seeds, beat the non-seeded pairing of Tomokazu Harimoto and Miu Hirano (15-13, 11-5, 11-8). Disappointment for the host nation but Maharu Yoshimura and Kasumi Ishikawa shouldered responsibility. The top seeds, they duly delivered. They ended the hopes of Korea’s Jang Woojin and Jeon Jihee, the no.6 seeds; they prevailed in four games (11-1, 3-11, 11-7, 11-6). At the semi-final stage Maharu Yoshimura and Kasumi Ishikawa meet Lee Sangsu and Choi Hyojoo; Ho Kwan Kit and Lee Ho Ching oppose Liang Jingkun and Chen Xingtong. The penultimate round matches are scheduled for 1.30 pm on Saturday 9th June, to be followed by the final at approximately 3.30 pm.